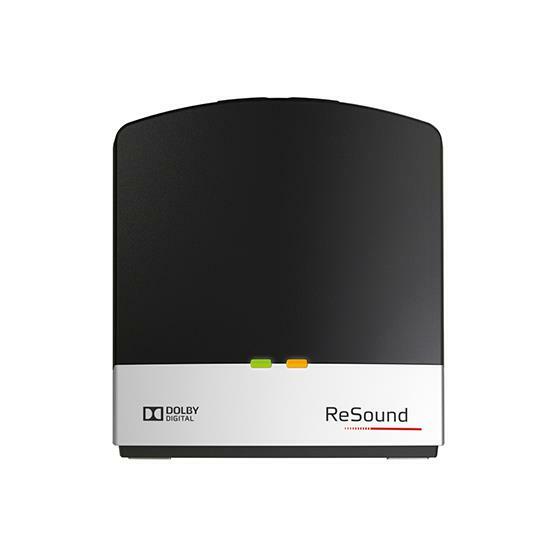 The ReSound TV Streamer 2 is very handy and easy to set up and use. It will quickly become a valued part of your daily life. Do you have to choose be­tween watch­ing TV alone or not being able to hear when your fam­ily watches it? You can turn up the vol­ume to your hear­ing aids in­de­pen­dently of the vol­ume every­one else hears. Have trou­ble hear­ing the con­ver­sa­tion around you when the TV is on? With the Re­mote Con­trol 2 or Con­trol™ app, you can ad­just both the vol­ume of the TV pro­gram and the vol­ume of your hear­ing in­stru­ments in­de­pen­dently. Can’t hear the phone when you watch TV? If you have the Phone Clip+ a tele­phone call will over­ride the TV so you can de­cide to an­swer or re­ject the call. Have a newer dig­i­tal TV or an el­derly ana­log model? It doesn’t mat­ter – the TV Streamer 2 is com­pat­i­ble with all TV mod­els. Item comes new and boxed. Supplied by ReSound UK.